Honor a Special Person - Women's March Denver 2019. Listen. Unite. Act. The Womxn’s March is more than just a day, it’s a global movement, a lifetime commitment, and a personal journey. Donate in someones name - Honor a special person. 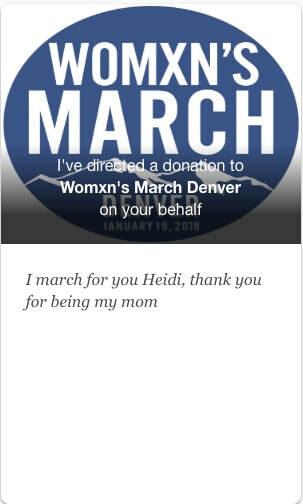 ​Make a donation to the Womxn's March Denver in honor of someone—to celebrate a birthday, wedding, holiday, #IMarchBecause or another special occasion.